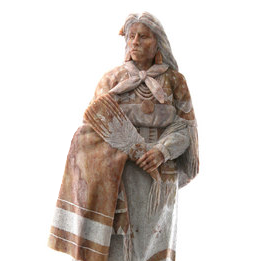 Oreland Joe is world-renowned for his work in stone and bronze sculpture. His works can be found in private, corporate, and museum collections in the United States and abroad. Oreland Joe was born in Shiprock, New Mexico on June 3, 1958. He is a native of New Mexico and is of Dine' (Navajo) and Ute descent. Oreland Joe grew up in the four-corners area most of his life, both on the Navajo and Ute reservations. Currently, Kirtland, New Mexico is home to his family and studio.